Bob Feller Indians Signed Romito Figurine! Bob Feller Signed Romito Figurine! Limited to a World-Wide Edition of Only 400, This Historic Signed Figurine Features Rapid Robert, Indian Great Bob Feller! This is one of our own. Licensed by Major League Baseball since 1995, Romito, Inc. has produced some of the most limited and attractive baseball figurines ever made. 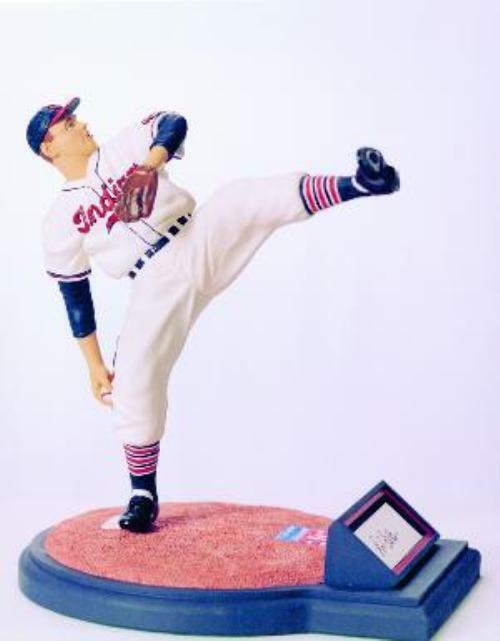 This Romito figurine portrays the great Bob Feller, one of the greatest pitchers ever. Limited to a World-Wide Edition Size of only 400 made, this figurine features Feller in his famous high kick windup, one of the most unusual of all time. It captures Feller perfectly, from the detail of the Indian logo on his sleeve, to the high trade mark leg kick. This figurine has the usual first class Romito features such as green felt and gold medallion on the bottom side of the base, tremendous quality in the base and a first class certificate summarizing Bob's career. In the frame, featured prominently is Feller's signature. The figurine is part of our Hall of Fame Series. Own it today! Here's your chance to own our figurine below the wholesale price of $100. Don't delay before we raise it back up to the SRP of $200! Mike Schmidt Phillies Romito Figurine! Catfish Hunter Romito NY Yankee Figurine!